Blue color is related to the Throat Center of human body. The organs linked to this color are:- throat, lungs, thyroid gland as the endocrine gland, digestive tract’s upper portion. If a person’s body has disorders or problems related to these organs then he has a deficiency of blue color which disbalances the Throat Center. If in a person’s body blue color is balanced, then he seems to be a calm human being. He loves peace and has a relaxed state of mind. The individual shall be tranquil and harmonious. When in an individual, blue color or Throat Chakra is in unbalanced state then some negative aspects are found. He is not worth believing. Would not be trustworthy. He would be unreliable, hypocritical. Likes to pretend and, is indifferent. Disorders related to blue color or Throat chakra are:- thyroid, anorexia nervosa, hearing problems, bronchitis, asthma, tonsillitis, mouth ulcer. 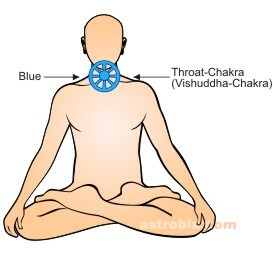 This is caused by the unbalanced proportion of blue color or Throat chakra in a human being. The blue color provides peace to an individual. This color relaxes a person’s body and helps in the treatment of disease. This color denotes communication as well. Blue color can be used in rooms. But, this is a peace loving color, so, it should not be used in physical activities and venues for sports. Include a blue colored clothing item or accessory in your attire regularly. Keep a blue colored piece of crystal or glass in your workplace, or in your home. Use a blue colored night-dress so that you may benefit from the energies while you sleep. Use blue colored bulb or night-lamp. If you don’t find a blue colored bulb, you can use a blue colored film to wrap around a regular white bulb. Include blue color in your home furnishing. Visualize the blue color in your head during the day.